When it comes to enjoying songs, karaoke machines are awesome. In fact, karaoke systems are sometimes referred to as singing machines. They come in a variety of options with different features that make them adaptable for kids, the home, portable use, and outdoor events. What’s more, the variations in the complexities of karaoke devices mean that it is possible to get cheap singing machines that will meet the needs of occasions that do not require large sound systems. Diverse music sources from streaming on devices such as smartphones, CD/DVD players, MP3 players etc. Before purchasing the karaoke machine, it is essential that certain things be known about the karaoke system to buy. These include the things expected from the machine, who will use it, how it will sync with other devices in use, whether it will need to be portable, and what kinds of music the device will play. If all that’s needed from the karaoke is just home entertainment and fun, the basic karaoke machines will suffice. However, when parties and shows are the goal, large professional systems that have loud speakers to produce sounds louder than the party noise, will be required. Additional microphone(s) may be used with the single microphone that accompanies the karaoke system when duets are going to be sung. Some more sophisticated karaoke systems even have audio effects and auto-voice control to enhance the professional output of the singer. Apps that support karaoke systems are excellent when recording and sharing songs but are not appropriate for party-like situations. Karaoke devices with simple controls are appropriate for kids as toys, particularly when they have flashing lights and nice designs. However, for adults, karaoke systems with much more complex features (like echo effects or equalization buttons) are more in demand. Musicians go for higher sound quality in their karaoke systems and sometimes upgrade their karaoke features to get better outputs and performances. 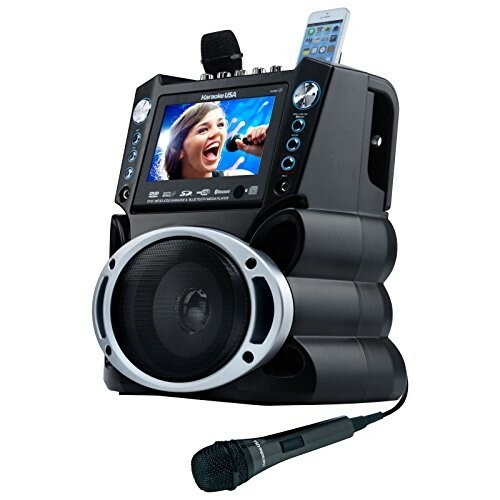 When portability is the priority because the karaoke will be moved around frequently, then portable karaoke machines are the answer. Such portable devices have basic units of the karaoke machine (such as their own speakers, amplifiers and monitor), however, the sound performance and power output may be suffer some loss of quality.